Why Do Wounds Itch When They Are Healing? If you've ever felt that irritating urge to scratch a cut, you may have wondered why wounds itch when they are healing. Perhaps you never put the two together, but it's true: wounds do itch as they heal. This can be frustrating to deal with, especially when you don't know the reason behind it. There are numerous theories about why your skin itches as it heals. For instance, an article on Advanced Tissue lists mechanical stress as one potential explanation. This occurs due to special nerve fibers in the skin. They react when there is an irritation - whether that is caused by something simple (like a bug crawling on you) or more complex (like wound healing). Another possible explanation for the reaction is histamine. Medical experts generally agree that a wound itches when histamine is released by the cells. This is a response to a physical trauma or the introduction of bacteria. Histamine is a substance produced by the body that causes an allergic type of reaction when released. 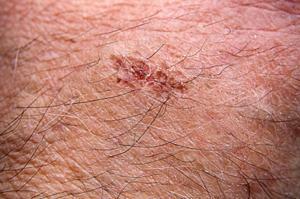 This explains the itchy skin one can experience when dealing with a wound. In the case of injury, histamine is crucial to the body's healing process, as shown in the study "Effect of Histamine on Wound Healing." The body releases histamine to trigger cells that help close the wound and create new tissue. This occurs during the second phase of healing. Just how the process is triggered requires a more scientific explanation. When the skin's nerve endings are stimulated enough to itch, that sensation is transmitted to the body's C-fibers (which send information to the central nervous system). According to the study "Basic Mechanisms of an Itch," these fibers have a direct link to itching - and essentially "deliver" the itch to the skin surrounding the nerve endings. The result is an itchy, uncomfortable wound. As time passes, your wound will transition from a fresh state to a healing state. It is during this period that you will experience an itchy sensation that is best attributed to the occurrence of new skin. Bear in mind that scabs are dry and rough, and when partnered with the development of skin growth, can cause you to feel itchy. During this stage of your wound's healing process, collagen is released to create new skin, which must stretch across the wound. The area may be sensitive, leading to an increased sensation of itchiness. It's interesting to note that even medical professionals can't say exactly why wounds itch when they are healing. However, there has been plenty of speculation on the subject. Some suggest that the act of scratching is a mechanism that may remove parasites or histamine from an area. Others believe scratching an itch is a pleasurable experience. Though none of these theories are proven in relation to wound healing, one thing is certain: itching is far easier to treat than pain. Washing the area gently with soap and water. This can remove dead skin cells that may be causing irritation. A moisturizer can lessen the effects of an itchy wound and prevent dryness. Covering up the wound with a bandage or clothing. Your desire to itch will be dramatically reduced. Applying an anti-itch cream, lotion, or cool compress to dull the itching. Itching is a common part of the healing process, but certain symptoms are not normal and should be taken seriously. These include increased pain, discharge, an unpleasant smell (which often signals an infection), swelling, and redness. If the wound takes more than thirty days to show signs of improvement - or you are experiencing severe itching - it is essential that you speak to a medical professional. These warning signs may indicate a serious underlying issue. If your wound is itchy but appears to be healing normally, don't worry about it. Keep the area clean, dry, and avoid scratching. Whenever you feel frustrated, remember: itching means your body is working to repair the cut.